We are playing catch up with this story. A committee of the Metropolitan Transit Authority on Wednesday voted in favor of what's called a "hybrid alternative" to improve traffic conditions where the 2 Freeway ends at Glendale Boulevard on the border of Echo Park and Silver Lake. Many Echo Park residents had pushed for another idea that would have created more park and public space, but the MTA said other transit agencies involved in the project could not get behind that proposal, according a previous story in The Eastsider. The MTA's Planning and Programming Committee voted to, among other things, spend more money to complete a study of the hybrid proposal, which would realign some of the exit lanes Residents had complained that the hybrid alternative was proposed by MTA staff at the last minute after years of public meetings and studies. But a consultant working with the MTA said the Silver Lake Neighborhood Council had sent a letter supporting the hybrid alternative. The full MTA board is scheduled to vote on the matter Dec. 1o. "Items need to be carried into A dumpster placed directly in front on Echo Park Avenue. Once cleared, the walls need to be washed and prepped for future painting. There is a large conference room carpet that needs to be removed along with bulky items like sofas, refrigerator, desks and old bank items that are no longer used. ITEMS NEEDED – Cleaning supplies, rags, paper towels, brooms, trash bags, shovels, gloves, water hoses, scrub brushes, buckets and anything else you can think that would help clean." Francisco Cendejas, an association board member, said in an email th at the group has now raised about half of the $134,000 needed to pay for the study. Another fundraiser is planned for next week but the group also faces a Nov. 20 deadline to raise the remainder. However, earlier this year, the group apparently was able to extend a previous deadline to raise sufficient funds. 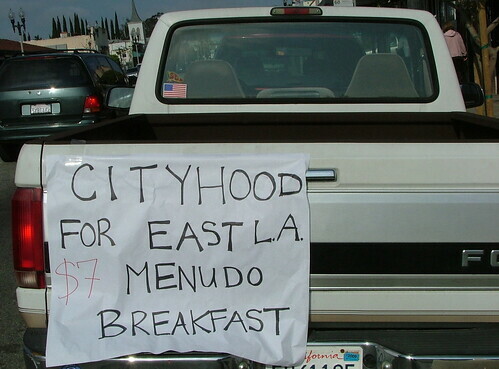 Menudo lovers will have to wait until the next breakfast fundraiser to enjoy their favorite meal. 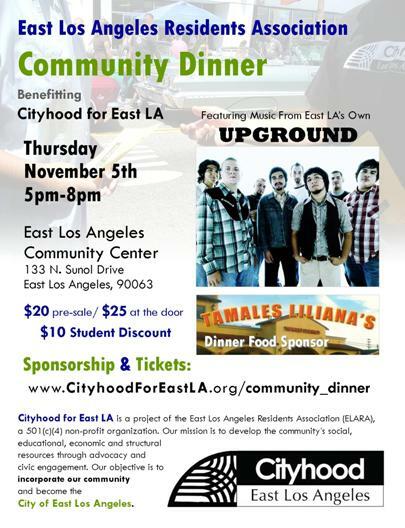 Tonight's cityhood dinner is being sponsored by Tamales Liliana's. * Correction: A previous version of this post identified Francisco Cendajas incorrectly as director of the East LA Residents Assn. His correct title is board member. Benjamin Cardenas is the director. Residents of El Sereno have waged a 25-year battle against investors seeking to build homes on what is called Elephant Hill on the boundary with South Pasadena. On Tuesday, residents declared victory after the City Council agreed to settle a lawsuit with the Elephant Hill property owners by buying their approximately 15-acre site and an adjacent 5-acre parcel for $9 million to create a future park. Still to be worked out, however, is how the city is going to pay for the deal to resolve the dispute, which has proved awkward at times for Councilman Jose Huizar. Huizar told the Los Angeles Times that the cash-strapped city will have to borrow money to buy the land and settle filed by the developer against the city. But how will the city pay off that loan? Huizar said the city will seek to be reimbursed by the state but did not provide any details about how much and when that would happen. Huizar has been solidly on the side of El Sereno residents in this fight. But he has also found himself facing off against one of his influential supporters and campaign fundraisers: Ben Reznik, the attorney and City Hall lobbyist representing the Elephant Hill developer. * This post has been updated with hotos of this morning's Elephant Hill press conference by Martha Benedict. The steep hills and narrow canyons of Debs Park in Montecito Heights provide a nearly 300-acre refuge in the middle of the city. There is nothing peaceful, however, about the tug-of-war being waged over Debs between mountain bikers, who want to open the park to off-road riding, and park advocates concerned about safety. The issue will be coming up at a Wednesday night public meeting in Highland Park as the city's Planning Department reviews an update to the city's Bike Plan. "The Debs Park Advisory Board unanimously opposes mountain biking on dirt trails in Debs Park. We do not believe that mountain bikers are entitled to displace the traditional park users. We do not agree with the argument that mountain bikers and hikers can safely use the same dirt trails. We do not believe any portion of the city's dirt trails should be shared with mountain bikers. It's like insisting soccer players and polo players use the same field--at the same time." The Echo Park neighborhood council - which has found itself meeting in churches and libraries as well as in parking garages and even a play ground - has finally found a permanent home. The Greater Echo Park Elysian Neighborhood Council has agreed to lease the back of the Bank of America at Echo Park Avenue and Sunset Boulevard for more than $400 a month. News of the lease comes about a year after the LAPD Stop-In Center, which acted as a neighborhood office for Rampart and Northeast division officers, in the same location closed abruptly without explanation, said Susan Borden of the Echo Park Security Assn. Councilman Ed Reyes introduced a motion to have the Los Angeles City Council approve the lease. Borden said the security association, Echo Park Chamber of Commerce and other community groups took it upon themselves to open up the 1,300-square-foot Echo Park Stop In Center in 1995 in a part of the branch that once housed walk-up teller windows and other offices. The chamber paid to install a bathroom in the space, a television set and office furniture were donated and the owners of the former Pioneer market used to provide snacks for the officers, Borden said. So, last fall, Borden was surprised to hear that the Rampart Division had decided to shut down the center without explanation. "It was a big disappointment," said Borden. "Maybe they can get it back to being of some use to the community." The lease must still be approved by the Los Angeles City Council. Councilman Eric Garcetti and his partner, Amy Wakeland *, have transformed their hillside lot in the Elysian Heights section of Echo Park into a large edible garden, complete with fruit trees, a vegetable patch and a "worm-factory." But if Garcetti and Wakeland ever tried to sell some of their home-grown crop to a local market they might violate an obscure 1946 city law called the Truck Garden Ordinance. The law prohibits homeowners from selling some types of edible foods and flowers grown in residential areas of the city. The ordinance forced Silver Lake flower grower Tara Kolla to switch from flowers to vegetables allowed under the law. Now, at the urging of community gardening and green advocates, Garcetti has proposed updating and clarifying the act to give urban farmers more flexibility to sell what they grow. It's been dubbed the Food Flower & Freedom Act, which is being championed by a coalition called Urban Farming Advocates. "There's definitely a growing interest in locally-grown food and I'd like to see increased accessibility to these products," Garcetti said in a statement. * Correction: Previous versions of this story identified Amy Wakeland by the wrong last name. The Eastside Citizen is interested in the city policies and politics that have an impact on our neighborhoods as well as the activities of neighborhood activists, elected officials and neighborhood council members. The Eastsider LA explores the joys, hassles, contradictions and general weirdness that defines Echo Park and the Eastside of Los Angeles. You can also expect news, history and tips on makin g the most of living in this corner of L.A. Defining the Eastside can be a touchy and heated topic. For the purposes of this blog, and practical reasons, The Eastsider LA will focus on Echo Park, where I live, and other neighborhoods in the northeast section of the City of Los Angeles. Got a tip, story, photo, video or blog post you want to share about your section of the Eastside? Please contact me. Our banner image features the work of Echo Park artist Mary-Austin Klein. This section of "Clouds Over Echo Park" was used with permission. Photos and image unless noted were created by The Eastsider. You can reuse The Eastsider photos only if you link back and credit the site. Thanks.